This A-frame tent has been built from such artifacts as have been found on recovered Viking ships. This tent has a rectangular footprint, with vertical openings in the center of the triangular end walls. The Viking age of expansion was a time when the people traveled widely by ship, both on the oceans and the rivers of their world. Thus, they needed portable shelters that could be carried on their ships and still set up quickly. 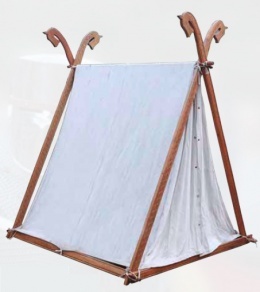 These A-frame tents met that need, and may even have used the sails of the ships themselves as roofs and sides. The recovery of any Viking artifact that has been long underwater or buried is always a challenge, as often the article deteriorates rapidly once exposed to air. Many reconstructions, such as this tent, are based on fragments that no longer exist, such as the Oseburg excavation of 1904-1905. While the archaeologists in charge documented their findings, many no longer exist. Among these are the wooden tent frames they found in the burial mound, which has been dated to 834 AD. Any reconstruction of such artifacts must be based on their written records. This page was last modified on 2 May 2014, at 17:57.